mrs sew & sow: Shall I show you mine ....? 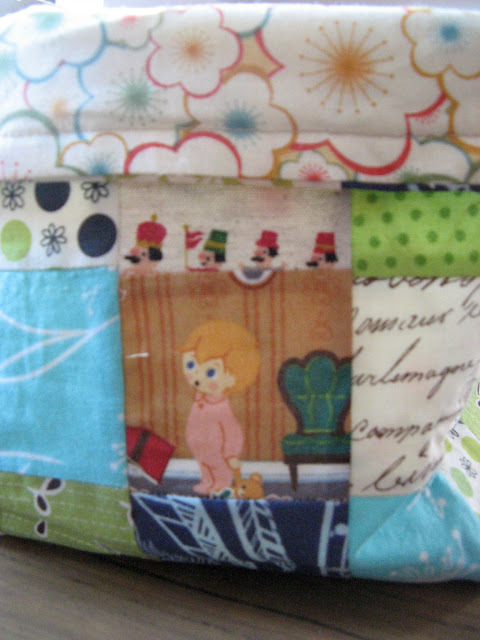 I entered the modern scrappy bits swap with glee as it is a relatively low stress swap and is fun to make for! Last time round I received a cute hexagon pieced purse from Grammypat but I have not shown you what I received yet this time and there is no excuse as it arrived on the same day I bid farewell to birdy! That certainly lifted my spirits! 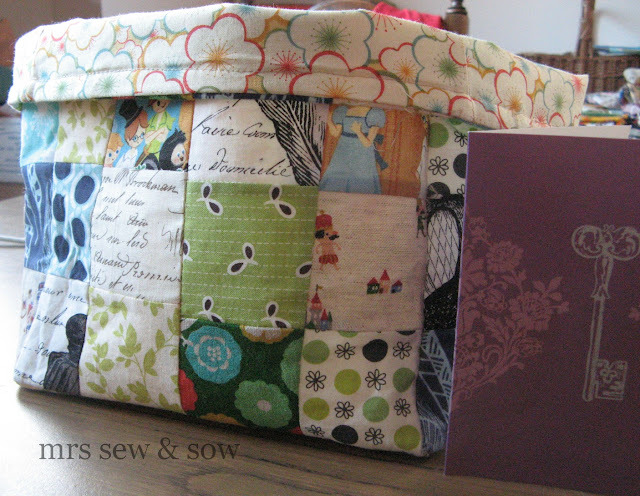 Here is my lovely fabric basket with cute fairy tale fabrics - I may have mentioned that I like those somewhere and my lovely partner Sarah picked up on that and my love of green, and text fabric! I can have lots of fun playing I-spy with it as I turn it round on my sewing table where it already has a place. And it is huge so it will help me to be a bit more tidy - always a problem for me until I have had enough and do a spot of cleaning! Not only that but I got some great scraps to go with, including some adorable Japanese fairytales - I do so love those! In fact I find them irresistible - just ask Helen, Sarah and Trudi - they followed my passion during the japanesecharmswap! Some fab wee pieces of HR (Heather Ross) are there too, some Echino and lots I don't know yet! I am keeping these special little treats in the basket at the moment but I may have to make something soon with some of those particular favs! Thank you so much Sarah - you caught my inner child and made it into a basket! Not as painful as it sounds! Gorgeous! Those scraps are fantastic, too! So lovely, and so right for you. 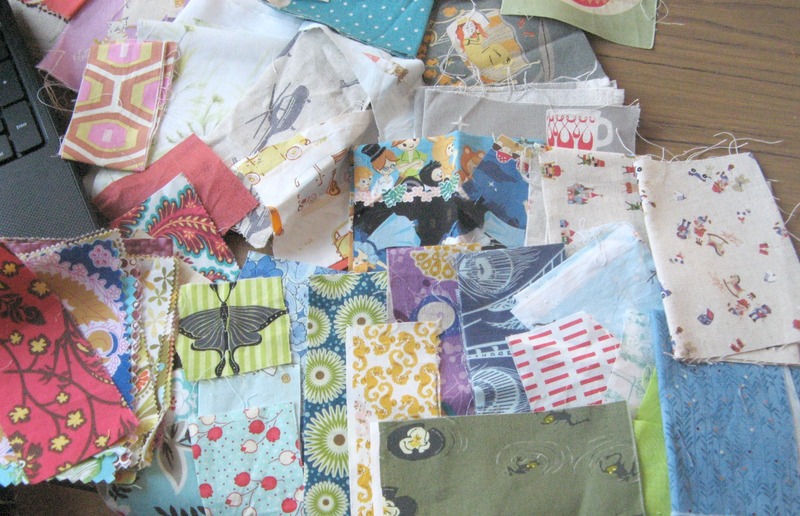 Really great scraps too! Sounds like a great swap and your partner nailed your likes completely! Ooh love the teeny square of Peter Pan fabric! I love that basket, there are so many lovely squares to look at and admire! I think you're going to have lots of fun with those scraps! Your partner certainly ticked all the right buttons there Nicky! Gorgeous swap!! Enjoy the goodies! !